Painted majolica plaques and vases were part of a range of Renaissance-inspired wares produced by Minton during the 19th century. These imitate Italian painted tin-glazed earthenwares (known as maiolica), but only rarely did they reproduce designs precisely. On this example, a Renaissance-style portrait of Queen Victoria is surrounded by 'grotesque' ornament. 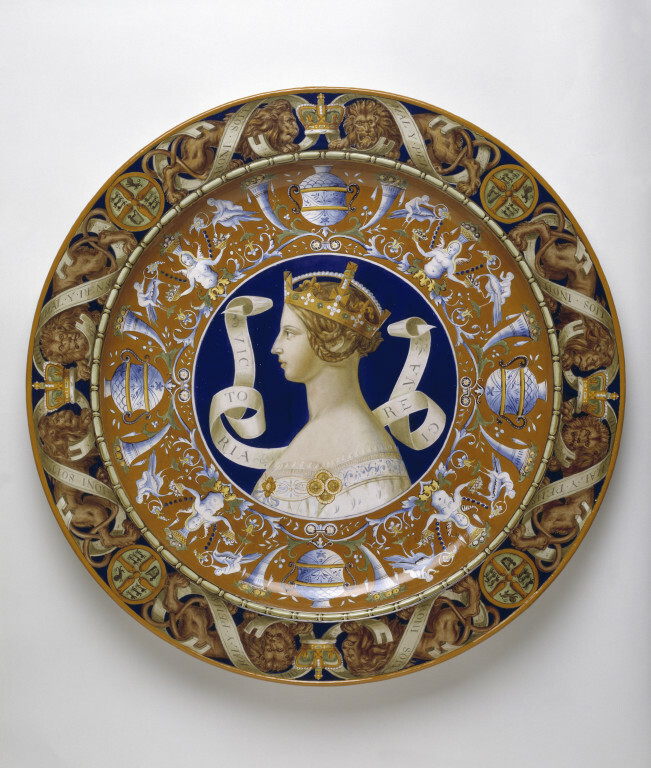 One of a pair, this plaque is an ambitious and technically accomplished object, and indeed, the two were displayed by Minton at the Paris Exhibition of 1855. The second plaque, depicting the Empress Eugénie, is now in the Swiss Cottage, Osborne House, Isle of Wight. This plaque was painted by Thomas Kirkby (1824-1890), who was born in Trentham in Staffordshire. Kirkby was employed by Mintons from 1841, and was said to have painted the first piece of majolica produced by the firm. He certainly played an important role the production of the wares. These portrait plaques, made after designs by Silas Rice, clearly demonstrate his accomplishment as a pottery painter. 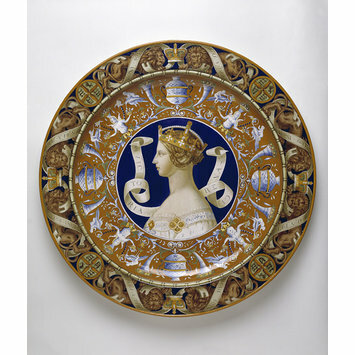 Earthenware painted in enamel colours in the style of maiolica, and consciously imitates the older style with grotesques and a profile bust of Queen Victoria. In 1855, at the time it was collecting Italian Renaissance maiolica, the Museum purchased this contemporary dish from the Paris Exhibition. It consciously imitates the older style with grotesques and a profile bust of Queen Victoria. Painted by Thomas Kirkby (born in Trentham, Stoke-on-Trent, Staffordshire, 1824, died in 1890); made by Minton & Co., Stoke-on-Trent, Staffordshire. Starcky, Emmanuel, Napoleon III et la reine Victoria: une visite à l’Exposition universelle de 1855, Paris: Réunion des musées nationaux, 2008.